Liam Smith, 16, was last seen getting off a bus in an Aberdeenshire village on Saturday. The family of a teenager who has been missing since the weekend have spoken of their desperation to find him and get him home safely. Liam Smith, from Aberdeen, was last seen boarding a 202 Stagecoach service at Union Square bus station in the centre of the city at 1.11pm on Saturday. Police thought he had disembarked in Lumphanan around 90 minutes later but, following inquiries, they now believe the person seen leaving the bus in the Aberdeenshire village was not Liam. It is now believed he may have got off the bus in Banchory, where search efforts are now focused. His mother Alix Smith said: "It is now been three days since we last saw Liam and we are completely shocked and devastated by his disappearance. "We are so worried about him and really anxious to find him and take him home. "If Liam sees this message I don't want him to be concerned about being in any trouble. I just want to find him." She has asked people near the search area to check their sheds and outbuildings for Liam, saying he may be taking shelter somewhere. "We are desperate to find him and we are becoming increasingly concerned as time goes on," she added. 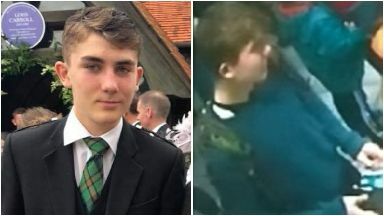 Police are urging anyone who was on the bus or who lives in the Banchory area and may have seen Liam to get in touch with them. When last seen, he was wearing a dark top, blue jeans and Nike Air Max trainers, and is also understood to be carrying a camouflage North Face backpack. Chief inspector Martin Mackay said: "We are continuing to urge anyone with information to come forward and we now would particularly ask people in the Banchory area to think back to Saturday and consider if they have seen Liam then or at any time since. "We know that Liam bought a ticket for Raemoir Road, Banchory, and would ask anyone who may have been in that area around 2pm to think back to that time as they may be able to assist us in establishing his current whereabouts. "Naturally Liam's family is extremely concerned and we just want to trace him as soon as possible to ensure he is safe and well. "I would also like to thank residents in Lumphanan for their support of our inquiries today and continue to urge anyone with information to let us know as soon as possible."